A man and woman charged in the killing of a Dickson County deputy appeared in court on Tuesday. Stephen Wiggins and Erika Castro-Miles have both pleaded not guilty in the death of Sgt. Daniel Baker and charged with 12 counts, including first degree murder, criminal impersonation, tampering with evidence and theft. Sgt. 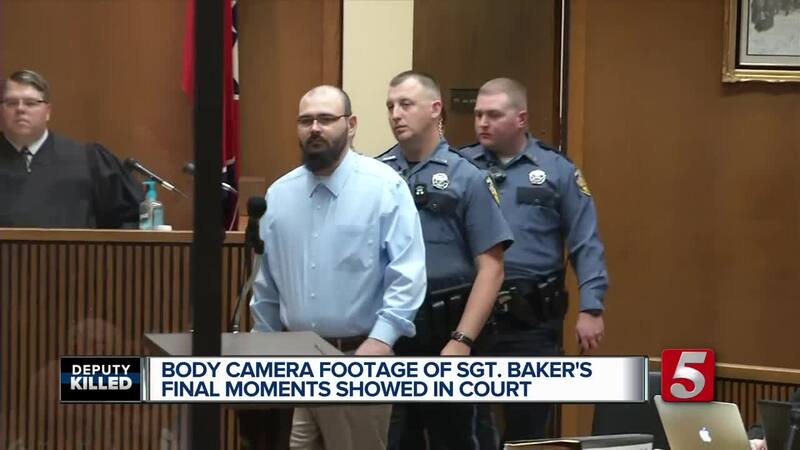 Baker's body camera footage was played during Tuesday's hearing. The judge warned those in the courtroom of its graphic nature, which was clearly disturbing for some in the room. It showed Sgt. Baker walking up to the vehicle Wiggins was driving. Erika Castro-Miles was in the passenger seat. Baker and Wiggins had a brief exchange before Beker walked away to make a call on his radio. After reviewing the Wiggins' tag number and likely realizing it was stolen, the video intensified. Baker walked back to the video and ordered Wiggins to get out several times. Wiggins is heard saying he can’t. Wiggins claimed he couldn't get out of the vehicle because the door physically wouldn't open. Baker asked if he could get out of the driver side door. That's when Baker can be seen walking around the vehicle, and shots can be heard as Baker is then seen running away from the video as he frantically yelled he'd been shot. The Sgt. falls to the ground and several more gunshots can be heard. According to the TBI agent testifying, Baker was shot a total of six times. He said he was shot execution style, saying Wiggins told officials he was making sure the Sgt. was dead, comparing Baker to suffering like a dog. The video then shows Baker's body being dragged and put into the back seat of his patrol car. The agent said Wiggins then burned Baker's body to try to destroy the evidence after watching TV shows. At some point after the shooting, 911 dispatch captured Wiggins allegedly pretend to be Baker, responding on the radio saying "I'm good." Some in the courtroom cried after seeing the video, one woman, who was clearly emotional, had to walk out. Castro-Miles allegedly ran away from the scene after the shooting. Her attorney argued that she did not know what Wiggins was going to do in response to the traffic stop and that none of her actions aided Wiggins in the crime. After closing arguments, the judge said it was not necessary to make a probable cause determination because the defendants have already been indicted and a trial set. The case returns to circuit court as legal proceedings continue.